If you don’t have a Betfair account yet, you should register now. RebelBetting is a licensed Betfair software since 2014. 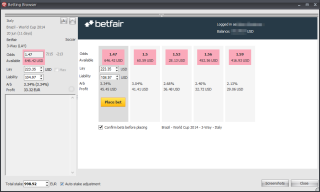 This means we work together with Betfair to bring you the fastest possible odds updates and the most sports arbitrages. Did you know you can bet on both sides of a match and profit no matter the outcome? RebelBetting helps turn gambling into an investment method using Betfair. Read more about sports arbitrage (sure betting) here. You need to log in to Betfair inside RebelBetting before you will get Betfair odds. This is a requirement from Betfair to keep track of their users. Click on the “Betfair Login” button at the top right corner of RebelBetting to login. Your password will never be saved, only sent encrypted to Betfair. Remember: if you don’t log in to Betfair you will not see any Betfair odds at all. You find the best odds available to the left. If the checkbox “Confirm bets before placing” is ticked, you will need to confirm the bet before the bet is placed. Otherwise the bet will be placed instantly. We strongly recommended you login to Betfair automatically when RebelBetting starts up. This will enable automatic background fetching of updated Betfair odds, which means many more arbitrage situations. 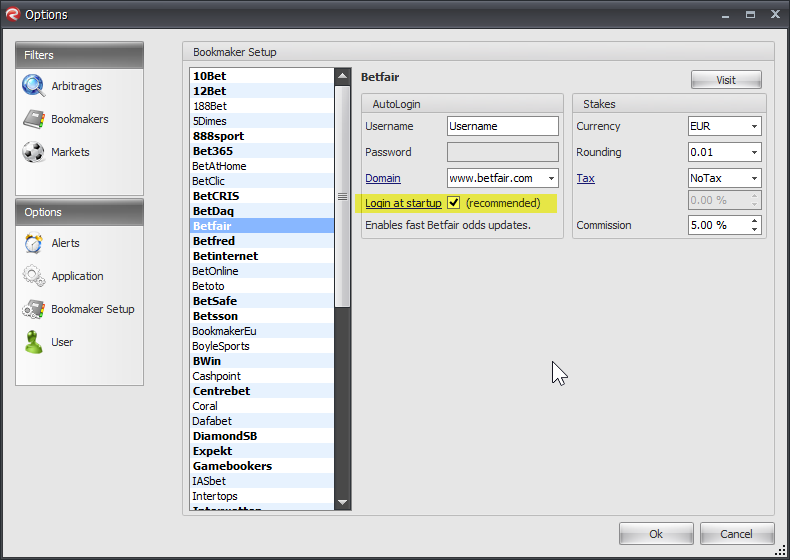 Login at startup is is enabled in Options / Bookmaker Setup / Betfair (click on screenshot above). You will then get a login form every time RebelBetting starts. RebelBetting is a certified Betfair application and can found in the Betfair App Directory. A security requirement from Betfair is that no proxy of any kind is used when communicating with them. 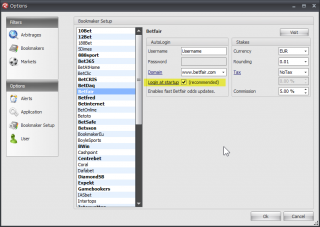 This means if you must use a proxy, you cannot take advantage of the Betfair integration. You do however have the option of running all Betfair communication directly, ignoring your proxy. (All other RebelBetting communication still use your proxy).